Photo credit: Katherine Rodriguez/Achona online/Piktochart Each grade will be given a section of the fourth floor to create art on the walls. During what would be convocation on Monday, Jan. 28, each grade went into a different classroom on the fourth floor. They were told that each grade of the high school was going to each have a section in the fourth floor to make a class mural. Students of each grade who were interested in participating in this art project, went into a classroom to brainstorm some ideas of what they could do. Each grade was given a different theme off of which to base their mural. Freshmen were given “passion”, sophomores got “integrity”, juniors got “unity”, and seniors got “courage”. The plan is to create these murals before they start construction of the fourth floor. The murals will be taken down during construction, but will be photographed, framed, and then hung up in the building once the construction is over. 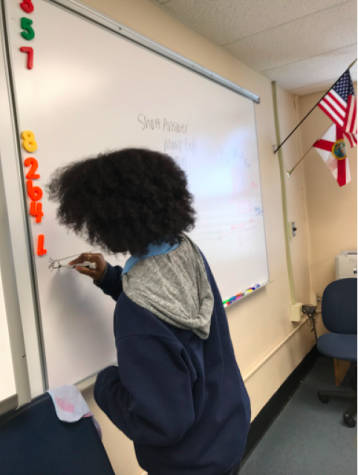 Chanita Belcher (’19) helps her classmates brainstorm during advisory. Members of the senior class were inspired by a popular Academy prayer to represent their theme, “courage”. 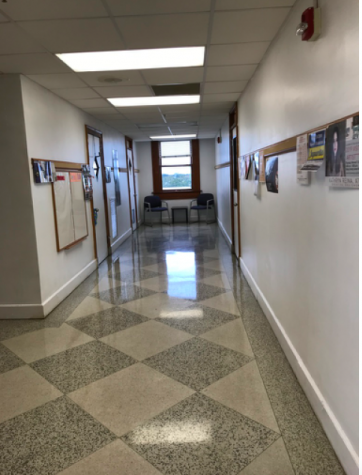 “We are planning to write the prayer: “God grant me the serenity to accept the things I cannot change, the courage to change the things I can, and the wisdom to know the difference,” on the wall, and then make it a tightrope, and then have an Academy walking across it,” says Madison Rooth (‘19). 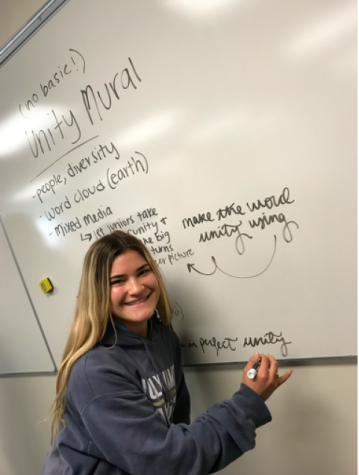 Lauren Jones (’20) writes down ideas for her class to express their theme, unity. The junior class are all participating in the mural by submitting a picture of something that goes with their theme. 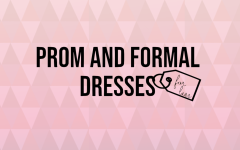 “We have the word unity and we are going to have it in block letters, and then fill them in with pictures that was submitted by the junior class. They are going to be that we believe symbolize unity,” says Kara Kivenas (‘20). Construction is planning to start in May. 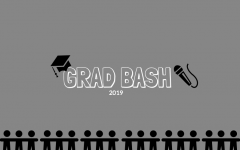 “The Convocation Committee talked about it as a good opportunity for you guys just to come together in grades, to come up with something that is representative of you and your school. Since the walls are going to be turned down, it is a nice way to come together, and do something fun. 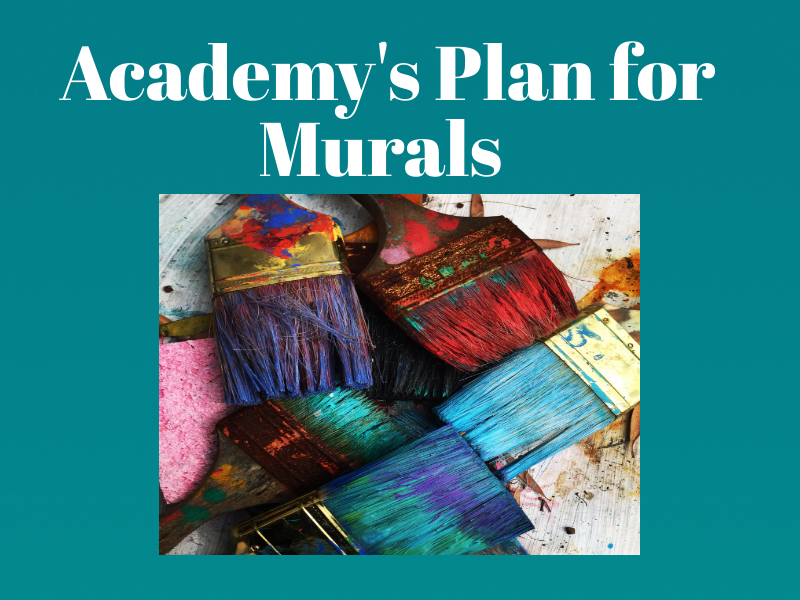 At the end before [the walls] are turned down, we will take pictures of [the murals], and then we’ll frame those pictures, and keep them in the new renovation, as a way to transition from old to new,” says Principal Stephanie Nitchals.